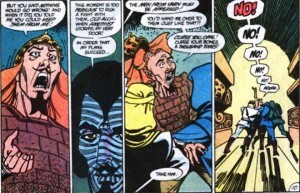 It is the second to last issue of the first Amethyst mini-series. Everyone heads for the final confrontation with Dark Opal! 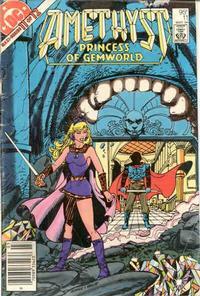 The cover of this issue shows Amethyst with a sword standing outside Dark Opal’s fortress. He waits for her inside, with his face in shadow. It is all very ominous! Let’s hope our heroes prevail! Maybe Opal should apply to go on Trading Spaces to get his place fixed up so it no longer is an infectious open sore. Carnelian is hanging out in his room with his pet snake, gloating that he has captured the amethyst fragment and Opal doesn’t know anything about it. 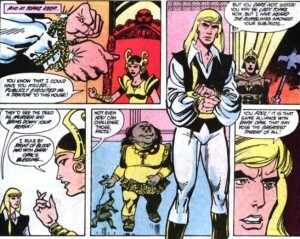 He thinks that while Opal may have magic, he has all the smarts in the family. As Carnelian sits thinking about how he’ll make Dark Opal beg for the amethyst, it is ripped out of his hand by an unseen force. That would be Dark Opal, coming to get the amethyst. Oopsie! Carnelian chases the bouncing amethyst down the hall only to run into Dark Opal’s boot. Dark Opal says that Carnelian should know that nothing escapes his notice in his fortress. 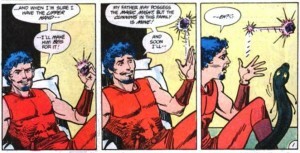 Carnelian says he was only guarding the amethyst fragment for his father. Carnelian’s pet snake gives Dark Opal a kiss. Poor Carnelian, betrayed by one of his few friends! Dark Opal says that Carnelian’s machinations played right into his hands and Princess Amethyst has played exactly the role he expected. Amethyst and her allies fly towards Dark Opal’s Fortress. When they land, they start battling Dark Opal’s forces, fighting their way to the entrance of the fortress. Amethyst wishes Topaz was with her, but he’s been captured by his sister. 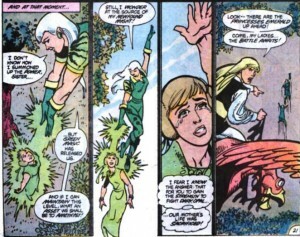 Lady Topaz comments that she could have Prince Topaz executed as a traitor. He replies that he’s heard the rumblings of discontent among her subjects, and if he’s killed they’ll know it was murder and rebel against her. Lady Topaz says that she rules by right of blood with Dark Opal’s blessing. Prince Topaz explodes “You fool! 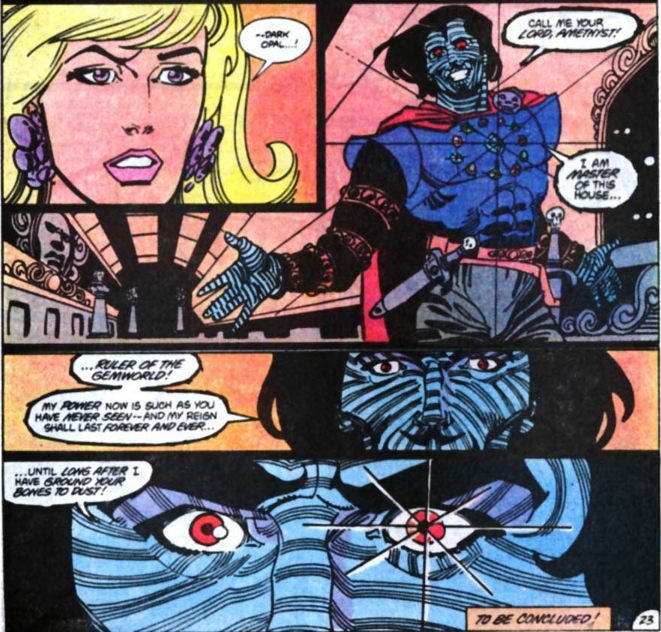 It is that same alliance with Dark Opal that may pose the greatest threat of all!” Lady Sapphire interrupts to say that Prince Topaz is correct about Dark Opal. She says that his behavior was quite deranged when she last visited him. Topaz begs her to stand against Opal with Amethyst. In House Emerald, the Vizer hands Crazy Lady Emerald a very special drink. The fighting continues at Fortress Opal. Dark Opal heads to the forge to order his blacksmith minion to finish making his magic breastplate with all the stones of the Gemworld houses welded to it. 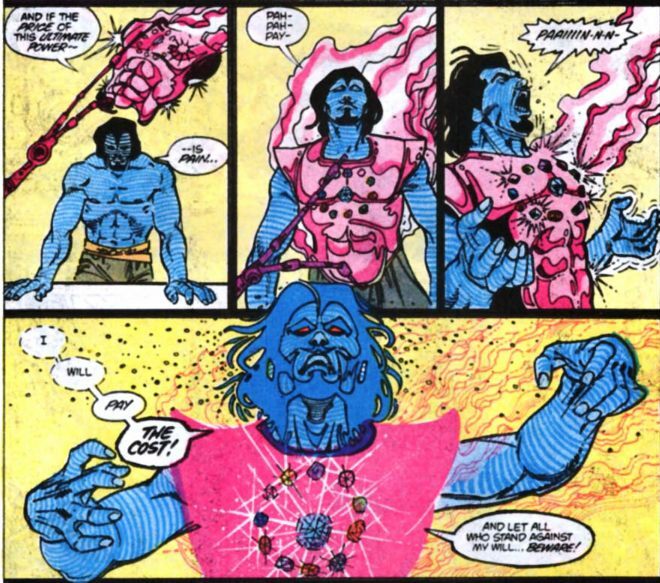 Opal goes to place the amethyst in it as the final stone, but he’s distracted by his hand suddenly turning yellow. 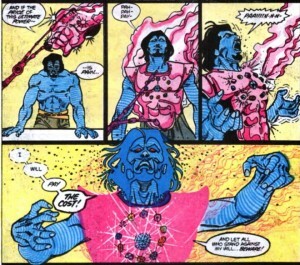 Citrina placed a mark on him when he was attempting to kidnap Amethyst by reaching through a magic portal many issues ago. Carnelian sits in a corner of the fortress with his faithless pet snake, wondering what will happen to him when Opal has absolute power. He’s distracted by a sudden wind. Opal and Sardonyx notice that it has become breezy too. The source of the wind is the Emissaries of Varn. They’ve come to collect on their contract, and since Opal had Sardonyx sign it, he turns Sardonyx over to the Emissaries. 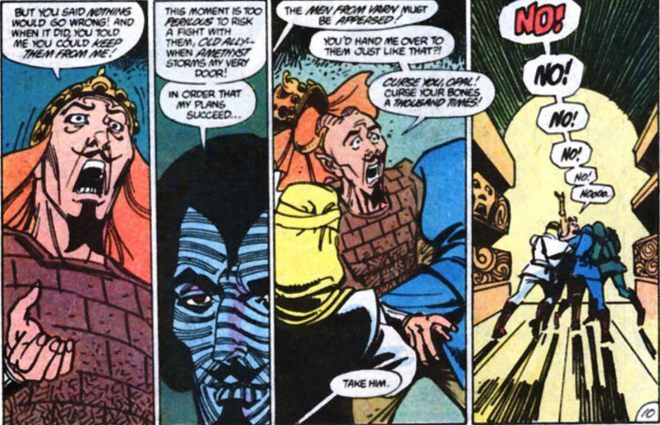 As Sardonyx is being swallowed up by the Emissaries, he vows to get his revenge against Dark Opal, saying “When the demon dragons have feasted on your flesh and spat out the remains I’ll drink my wine from your hollow skull!” Everyone keeps referring to these demon dragons, but we’ve never actually seen one. I wonder what they look like. As Amethyst and the other Gemworld nobles battle outside, Dark Opal calls forth a creature from the earth. Amethyst and Garnet struggle against it until Amethyst realize that the creature gets it strength from touching the ground. Garnet picks the creature up by the leg and whirls it over his head into nothingness. I’m really not sure about Amethyst’s battle plan. 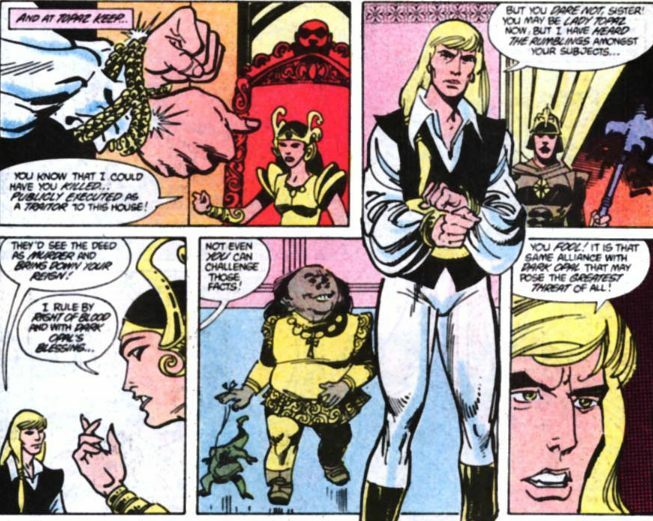 She heads over to Dark Opal’s place with less than a dozen representatives of Gemworld nobility. I know everyone has magical powers, but wouldn’t it have made sense to raise an army or something? Dark Opal is gloating in his fortress, when he wonders what Carnelian’s up to. Carnelian is trying to strangle his pet snake with his claw. 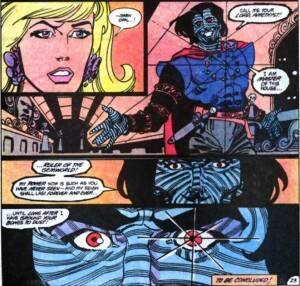 Dark Opal finds him and says that he expected Carnelian to be near the forge with sabotage in mind. Way back when Dark Opal tried to make the breastplate for the first time (in a preview comic that ran in an issue of The Legion of Super-Heroes) Carnelian foiled his plans. Dark Opal passes on Citrina’s brand to Carnelian. It looks like it smarts! Dark Opal heads down to his forge to get the spiffy magic breastplate. He orders his blacksmith to place the breastplate on him immediately so he can conquer all his enemies now. The blacksmith points out that the breastplate is still glowing from the forge. Dark Opal doesn’t want to wait, because flesh burning hot metal is the newest look in the Gemworld Fall Fashion Forecast. The Emerald Princess are flying, trying to reach Amethyst. Their flying horses are suddenly grabbed by malicious tree limbs and they fall. Emmy cries out for her mother. Lady Emerald has just finished her poisoned drink. The vizer tells her it was a potion to make her drowsy, and he cries as he tells her to close her eyes and sleep the sleep of death. Princess Emerald suddenly summons up the magic to break her and Emmy free of the trees. Princess Emerald doesn’t know why her magic was suddenly augmented, but Emmy knows that their mother’s life was sacrificed so they would have the strength to fight Dark Opal. Topaz picks up the princesses, he’s joined by his sister and Lady Sapphire. They all hasten to battle. Amethyst and her group reach the inside of the fortress. Topaz joins them, saying “I will be always at your side Amethyst.” She’s happy that Lady Topaz and Lady Sapphire are there too, because they’ll need every able body in order to beat Dark Opal. Tune in next week for the final issue! This entry was posted in comics and tagged Amethyst Princess of Gemworld on 7/25/2008 by Anna.